Super Pixel Racers is a graphically 16-bit racer played from a top down perspective. Developed by 21c Ducks and published by H2 Interactive, it was launched on PS4 and XB1 October 31, 2018. What initially looks like a modern re-implementation of R.C. Pro-Am, Super Pixel Racers builds on the old formula by introducing new depth to the classic gameplay along with multiple game modes. The controls are incredibly simple: Push the Left analog stick in the direction you would like your car to automatically accelerate, tap Drift to hastily screech around corners (filling the nitro bar), and slam the Nitro after turns and on long stretches to gain bursts of speed. The first few races feel genuinely awkward. It takes a couple laps to harness your slide around corners with drift. If you do not have enough speed when a drift begins, you may find yourself stopping dead or cutting so hard into the turn that you hit the barricade. Once you’ve become proficient with drifting (and filling the Nitro bar as a result), proper use of your Nitro is essential to pull ahead of the pack and finish first. I found that using a small nitro burst after any major turn straightened out my lines around corners and kept me on the track and accelerating faster than the competition. Many hours into the game, racing felt sharp and slick. Not often does a game have me gripping the controller this tightly, forcing me to be super focused on making perfect laps to beat a time trial. Difficulty ramps us at a nice pace, with many distinct events to keep you engaged. There are four game modes that keep you racing to earn in-game cash that can be used to purchase and upgrade collected cars. Free Race allows you to practice with whatever car, track, weather, time of day, or difficulty you would like to challenge. Local Multiplayer has split screen options for up to 4 players across a few different race types such as Rally, Takedown and Hunt. Online Multiplayer collects up to 8 users and sets them against one-another in random races. Unfortunately, at the time of this writing no more than 1 other person was found online at any time during the week of casual play put into this review. Career Mode is the main game mode for Super Pixel Racers. Starting off in “C” class with an incredibly slow vehicle, there are more than 200 races to complete and many cars to unlock along the way. You can use the Garage to upgrade your car’s Top Speed, Acceleration, Nitro, and Durability before each race by spending your hard earned cash. Career Classes are initially filled with single events that are completed when you place in 3rd or better, which unlocks future challenges in that class. 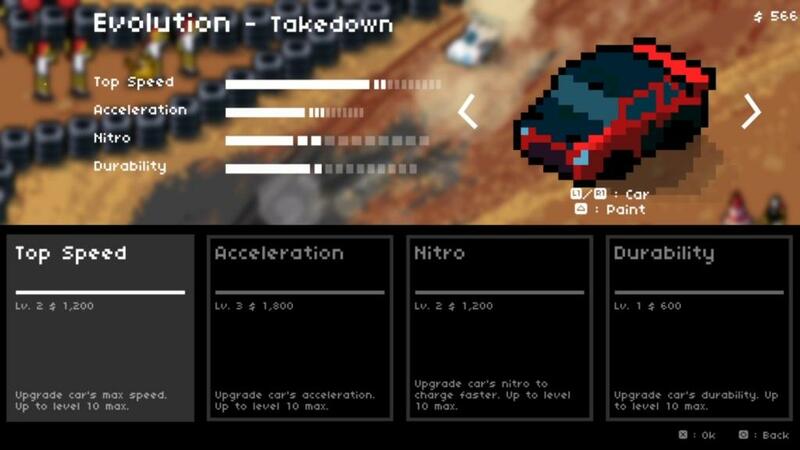 Once all challenges are complete you move up to the next Class, which includes new tracks, race types and vehicles (which are all much faster than “C” class!). Career mode keeps your interest by changing up the types of events you are pitted against. Rally Cross races are populated with a full roster of aggressive computer controlled opponents. Time Trials are a race against a specified time. Drift Show events test your drifting and nitro skills. Score is based on long, fast drifts and the target needs to be achieved within a limited time. Rally mode is a randomly created checkpoint based highway race where you must drive a certain distance before time runs out. Checkpoints in Rally races add a few precious seconds to the clock, and must be driven between and not around to be credited with the time (much to my chagrin). 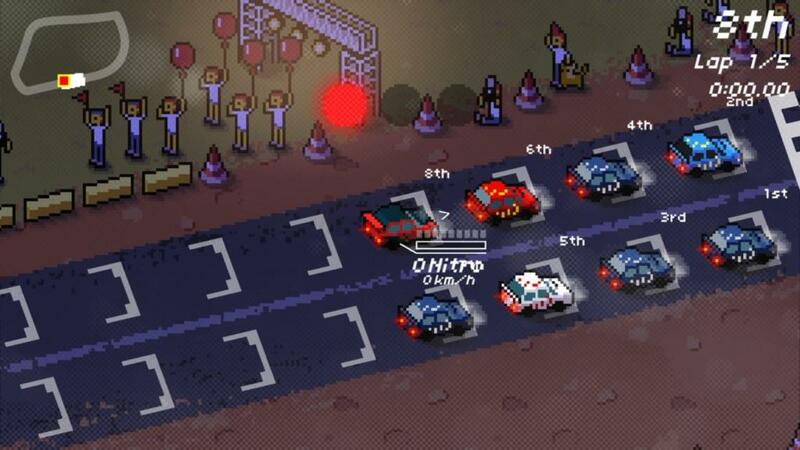 Land Rush is similar to Rally mode, being a long stretch of randomly created road, but this time there are computer drivers in the mix. Stay ahead of the pack for long enough to claim victory. Takedown mode challenges you with simply ramming your opponents with Nitro to make them explode; never difficult, yet always amusing. It is worth mentioning that Super Pixel Racers has an incredible chiptune soundtrack. From the title screen to every event, the music was catchy and fun. It authentically fits the graphics style of the game as well. Super Pixel Racers is charming, challenging, and fun. It is an easy game to sit down with and play for a few minutes, or a few hours. While it doesn’t have the same broad appeal as a Mario Kart game, it does scratch a retro itch (with modern enhancements) making it a unique experience.